In this week’s episode, ‘A Dead Man Feels No Cold’, Mr. 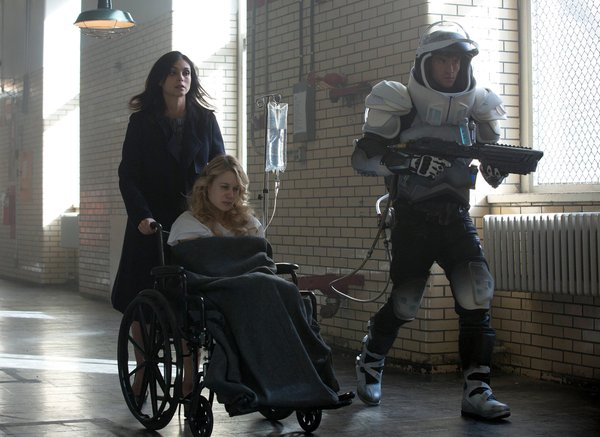 Freeze tries to break out Nora so he can save her, while Hugo Strange begins his experiments on Penguin. The show has a lot of different stories at hand now so it’s going to be a lot of work to keep up. But we will do our best to do that. He amps up his freezing and will do anything he can to save his wife, freezing anyone that gets in his path. He creates not only a new freeze bomb but a freeze suit which makes it a wee bit harder for Gordon and Bullock to take him down. Before she goes down for the big freeze, she switches the cartridges so that she will die rather than be frozen. Wanting to be with her, he does the same. Comic book kind of Romeo and Juliet. Strange takes Penguin to the experimental lab and starts to work his experiments on him. Peabody, his assistant, may just be as Cucoo as Strange. That’s not the only thing he wants. He makes a deal with Freeze. He helps him escape while he gets a flask of his freezing stuff. Bruce is now obsessed with finding his parents’ murderer and after what happened last episode with him. Thompkins tries to help but he may be too far gone. Alfred makes a deal with him: when they find the killer, he will be the one to kill him. I mean he’s not above killing people, but I highly doubt he will actually go through with it. He will probably figure out a way to get out of it. Maybe that’s what will lead Bruce to go to the League of Shadows? You can get the full recap here. In the next episode, Alfred tries to get Gordon to help him stop Bruce who is ready and willing to kill the person responsible for killing his parents.